This article gives you complete information about Larisa Latynina, Oldest and best Gymnast from soviet and also won nine gold medals in Olympics. This article also includes profile, biography and career history of Larisa Latynina. Medals won by Larisa Latynina is also quoted in this Article. The full name of Larisa Latynina is Larisa Semyonovna Latynina who was born in the year 1934 December 27 at Kherson, Ukrainian SSR, Soviet Union. 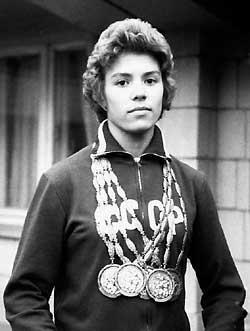 Larisa Latynina was the first and only Woman Gymnast and athlete who attains Nine gold medals in Olympics in three appearance. Larisa Latynina won a total of 18 medals. She was one of the best Woman Gymnast with special skill and technique. Record for Most individual medals in Olympics are also in the name of Larisa Latynina. Larisa Latynina was retired from Gymnastics in 1966. After retirement she became Soviet Union gymnastics team coach. Latynina started her career in the year 1954 by winning a Gold medal in 1954 Rome World Championships. In Summer olympics held in the year 1956, Latynina grabbed gold medal in floor and vault event and silver medal in uneven bars. She continued her success career in 1960 summer Olympics held in Rome where Latynina played an important role in All around event which helped Soviet union to reach first four places. She also showed her talents in 1962 World championships by winning all around event. In 1964 Tokyo Olympic games, Latynina won two gold medals, Two silver medals and two bronze medals. In total there are eighteen medals won by Larisa Latynina in Olympics which includes nine Olympic gold medals.